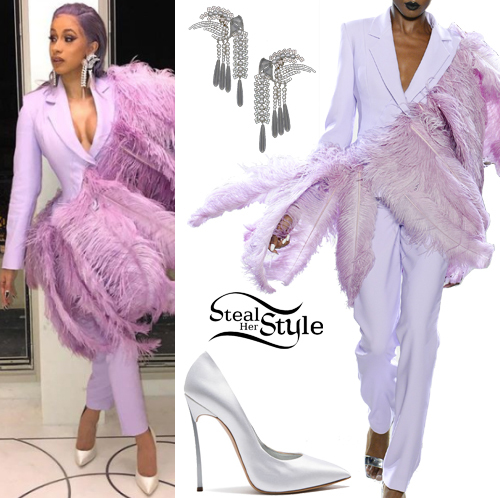 Cardi B peformed at the Etam Fashion Show in Paris wearing Christian Cowan Spring 2019 RTW Suit (Not available online), Dylanlex Angelou Earrings ($680.00) and Casadei Blade Satin Pumps ($375.00). Cardi B attended the Tom Ford fashion show this evening as part of New York Fashion Week wearing a Tom Ford Spring 2018 Dress (Not available online), custom-made Dylanlex Earrings (Not available online) and Giuseppe Zanotti Harmony Velvet Sandals ($845.00). Cardi B was spotted leaving Prabal Gurung Fashion Show during NYFW wearing a Prabal Gurung Kay Trench Coat ($3,795.00), Dylanlex Axel Necklace ($380.00) and Alexander Wang Caden Fishnet Ankle Boots ($995.00). You can find similar shoes for less at Missy Empire ($37.37). Beyoncé posted some pictures yesterday wearing a Gucci Floral Embroidered Jacket ($5,450.00), Mama.licious Tailored Trousers ($55.27), a Gucci Embroidered Brocade Drawsting Backpack ($1,790.00), a Dane Necklace ($555.00), Sarah Necklace ($390.00) and Becker Earrings ($345.00) all by Dylanlex, and Givenchy Ankle-Strap Mules ($850.00). Selena Gomez was spotted leaving Nine Zero One salon yesterday wearing a Vince Favorite Tank Top ($48.00), an Urban Renewal Vintage 90’s Levi’s Denim Jacket (Sold Out), Lululemon Hi Rise High Times Pants ($98.00), the Dylanlex Frankie Necklace ($810.00), Ray-Ban Round Sunglasses ($200.00) and The Row Alys Venetian Loafers ($995.00). Ashley Tisdale arrived at the 5th Annual BeautyCon in Los Angeles wearing a Free People We The Free Army Tee ($68.00), Citizens of Humanity The Principle Girlfriend Jeans ($198.00), a Dylanlex Sienna Necklace ($780.00 – similar style) and Givenchy Ankle-Wrap Sandals ($492.00 – wrong color). 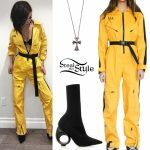 Kendall Jenner was spotted arriving at The Nice Guy with Gigi Hadid wearing a Rylie Baby Tee ($79.00) and the Zillah Slip Dress ($299.00) by Are You Am I, an August Getty Atelier Spring 2016 Coat (Not available online), a Dylanlex Crystal Necklace ($810.00 – similar style), a Givenchy Lucrezia Micro Bag ($1,490.00) and Balmain Fall 2016 Over-The-Knee Boots (Not available yet). You can find similar boots for less at CiciHot ($26.99). Kendall Jenner was spotted arriving at Kylie’s 18th Birthday at The Nice Guy last night wearing a House of CB Lelisa Bandeau Top ($60.00), the LaQuan Smith V Wrap Wool Skirt ($500.00), a Dylanlex Crosby Necklace ($780.00) and a pair of Aquazzura Linda Heels ($675.00). Jhené Aiko performed live on NBC’s The Today Show on Friday wearing a Dylanlex ‘Tyson’ Necklace ($820.00), an American Apparel Underwire Swimsuit ($68.00) in French Rose, and a sheer white dress similar to the For Love & Lemons Lil Darlin Maxi Dress ($170.00). Rihanna was spotted leaving a nightclub in New York City last night wearing a Spock Sweatshirt ($295.00), a pair of Buck Roger Sweatpants ($369.00) both by Venus X Mars, a pair of Christian Louboutin So Kate Glitter Pumps (not available online) and a Dylanlex Falkor II Necklace ($1,080.00). You can get similar heels from Charlotte Russe ($32.50).